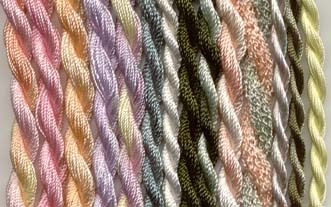 These thread packets are great for the beginning stitcher who needs a little help in deciding what colors to put together and also to give the stitcher some of every weight available. 5 Lola Skeins and 2 Iris Skeins in "Flower Colors"
1 Frost for your "centers"
All the sampler packets are color coordinated and include beads. 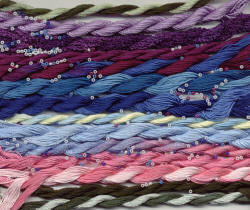 ENTER A NUMBER IN THE SQUARE THEN PRESS "ADD TO THE CART"
Thread Packet 15 The "Blues"
EdMar threads in Fruity colors. Apples, Peaches, Grapes, Raspberries, Strawberries, Oranges, Blueberries, Plums, Cherries, Lemons, Limes. 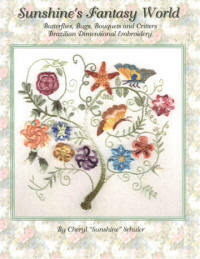 TP-25 "Fruit Salad"
EdMar threads that are collected in remembrance of brownies and more brownies! Blonde Brownies, Double Chocolate brownies, Brownies with yummy buttercream frosting and sprinkles. TP-26 "Brownies"
EdMar thread packet that started out as a grouping of green colors but I was reminded to give the picked beets and the bread and butter pickles their place in this grouping. TP-27 "Pickles"
Greens & Yellows These are the colors that first come out after the long winter. The grass starts to turn green, the little leaf buds on the trees start showing up and an the tulips and hyacinth start to peak out. Greens and aquamarine colors with a hint of ice. Pinks of every color and whites and creamy colors.